Camcare began as an organisation in 1976 when a concerned group of citizens decided to improve service provision in the Camberwell area for people who were disadvantaged. In particular, a local committee identified the need for accessible counselling services and financial assistance in a crisis. The emphasis was on local service provision, preventative and remedial counselling and an information service to provide people with knowledge about their rights and the services available in the community. Skilled volunteers were recruited, but from the outset there was also a decision to employ a professional social worker to deal with people presenting with complex personal problems and provide supervision and support to the volunteers. Camcare was located at Fairholm Grove, Camberwell from 1977-2008 before moving to our current premises in St Johns Avenue. Camcare’s roots are in community action by local residents recognising needs in the community and seeking to establish services to meet those needs, with vital support from the City of Boroondara. Both professional and volunteer staff were recruited and counselling services extended to members of the Camberwell community. Training was provided to the volunteers. In August 1977, Camcare’s services extended into Ashburton, supporting the Alamein community program which was responding to the needs of families living in the Alamein Housing Commission area who required support. This led to funding from the Victorian State Government for a family aide program and for Financial Counselling. Outreach work to local community houses occurred and initiatives, including establishing a local toy library and a food co-operative, were undertaken. In 2002, Camcare merged with the Kew Hawthorn Citizen’s Advice Bureau and a third service site was born, staffed largely by volunteers working with an Administrative Officer. Some Camcare professional staff provided counselling services on an outreach basis from this site and other services were co-located in the building with administrative support provided by Camcare. These included Eastern Domestic Violence Outreach Service, the Inner East Rooming House Group and a social worker employed by the City of Boroondara. Camcare closed this office in 2009. Services continue to be provided to Kew residents from the Camberwell Office. In 2016, recognition was made of Camcare’s contribution to the community for 40 years. Forty years of continuous service to Boroondara was celebrated with staff, volunteers, community partners, donors and Members. Funded by three tiers of government, Camcare is now a vibrant community organisation with services provided in the municipalities of Boroondara, Whitehorse, Manningham and Monash. Through active partnership with other organisations we have expanded our services and embraced community engagement activities and strategies to meet the needs of diverse groups within the community. Official opening of Camberwell Counselling and Care Service. The Ashburton office opens, a Legal Advice Service is established and the name ‘Camcare’ is adopted by the Board. A Camcare Auxiliary formed to raise funds, a financial counsellor was employed and the Camcare Charity Card and Gift Shop opened. The first youth counsellor was appointed. A pilot tax help scheme was established. A No-Interest Loans Scheme was introduced. The Kew/Hawthorn Community Information and Support Centre merged with Camcare and a Graduate Volunteer Counselling Program was established. Campbell McComas AM appointed as Camcare’s first patron. Tony Charlton AM accepted position of Camcare’s patron. “Camcare 30 Years on“, a book recording the first 30 years of Camcare was launched. The Kew office was closed. 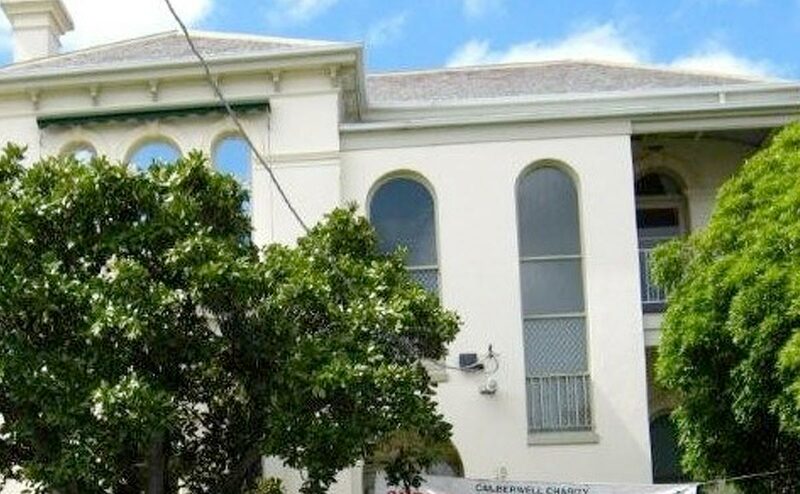 The new Camberwell office was opened at 51 St Johns Avenue, Camberwell by Governor David De Kretser. The Fresh Food Program and the Mother/Infant Group were established. The Community BBQ and the Kitchen Garden were established. Camcare formed a partnership with Swinburne University which has led to an expansion in student internships and projects particularly in marketing and fundraising. Camcare received funding from Inner East Medicare Local to provide PS4 Kids, psychological interventions for children 0-12 years with a focus on Ashburton. This subsequently expanded to provide services for youth and adults via referral from local GPs. Camcare with project partners, Eastern Community Legal Service and Dispute Settlement Victoria consulted the Ashburton community and delivered education sessions on neighbourhood safety and security in the Harmony Project funded by Department of Planning and Community Development. Professor David de Kretser AC became Camcare’s patron. The Financial Counselling Service was closed due to loss of State Government funding in a service recommissioning process. The Broadband for Seniors program was established. Boroondara City Council provided Camcare with seasonal access to premises on Riversdale Rd above the Camberwell Market for the Charity Card and Gift Shop. Camcare sustained a 71% cut in funding for Emergency Relief in the City of Boroondara after services were purchased on the basis of the SEIFA Index which measures disadvantage. The outcomes for Boroondara were skewed by significant numbers in the population on incomes higher than average. Unfortunately this meant Camcare had to cut back services to hundreds of people who were living in hardship, including food relief and small grants for essential items. Recognition of Camcare’s contribution to the community for 40 years.